The earpieces themselves, attached to the control unit that also holds the battery. 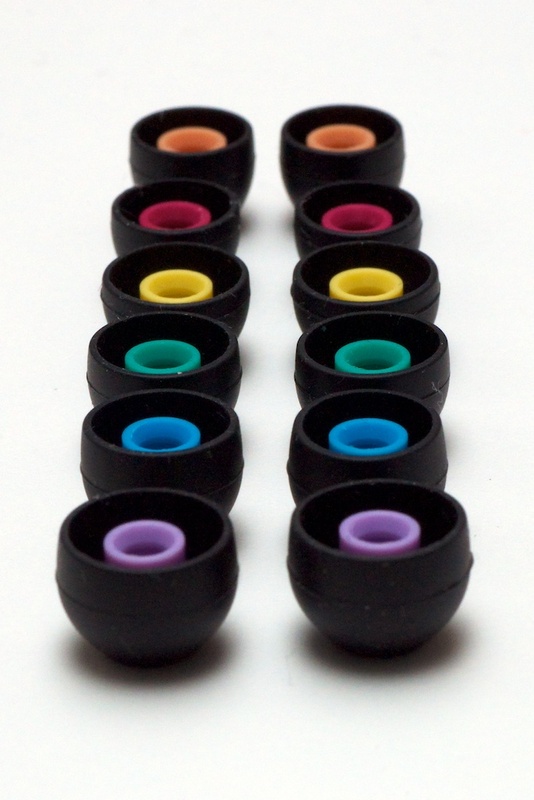 Seven different sizes of silicone-based eartips. Leather case that will also hold an extra battery. The earpieces themselves might seem big, and while they are a little bit bulky, they are not at all heavy or annoying to wear. The reason for their funny looking design, is the microphone at the back of each earpiece, picking up ambient noise in order to filter it out. 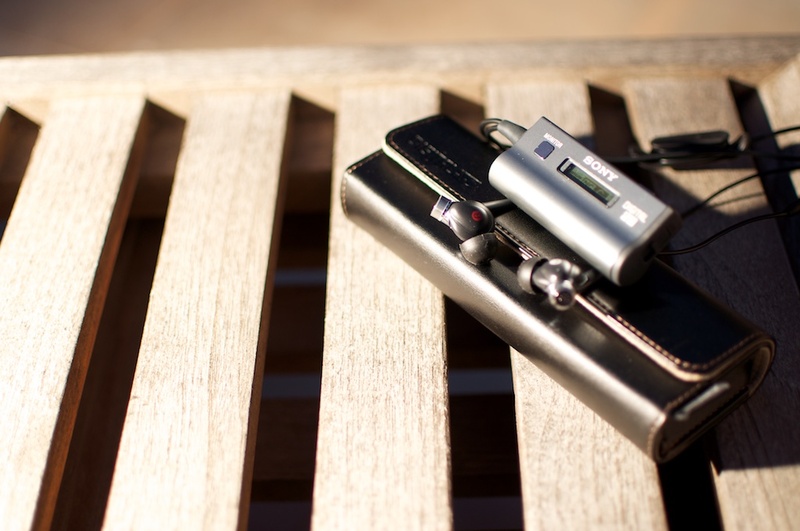 While most other in-ear headphones use passive noise canceling technology, these use active noise technology to eliminate outside noise with inverse audio signals. 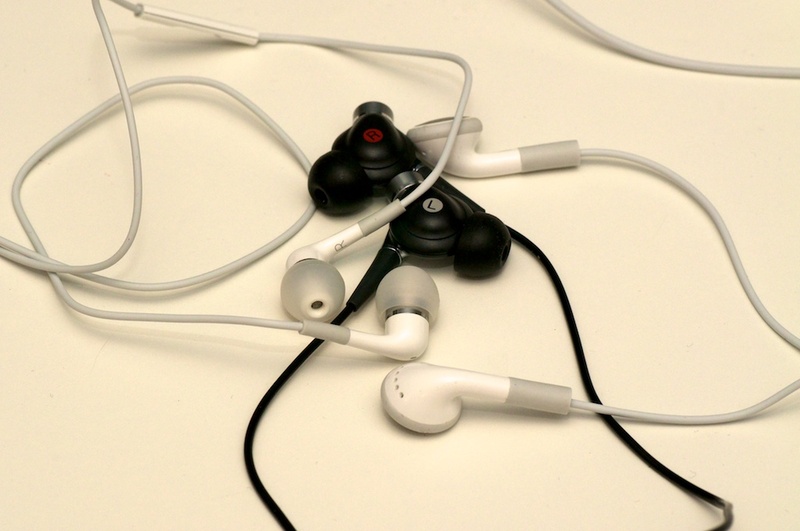 Attached to the earbuds, you’ll find the “control center”. 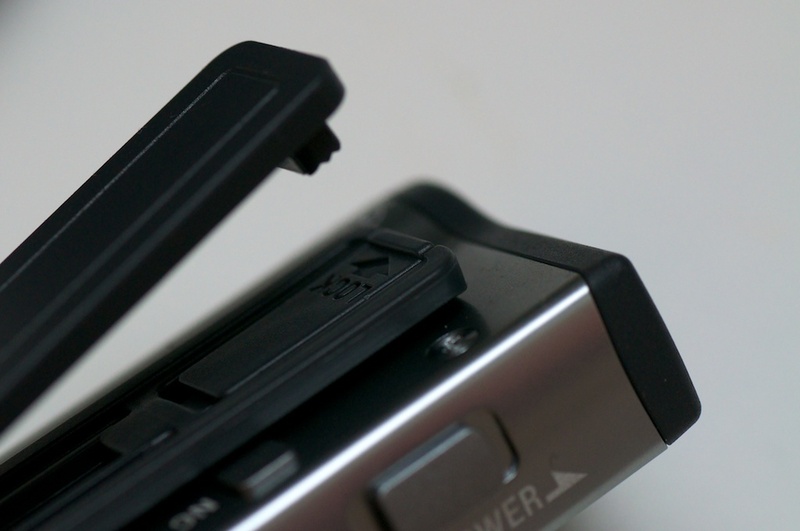 This is where the battery goes and where you can adjust the volume and a few other options. On the front of the “control center” unit, there’s just a display and a “monitor” button. 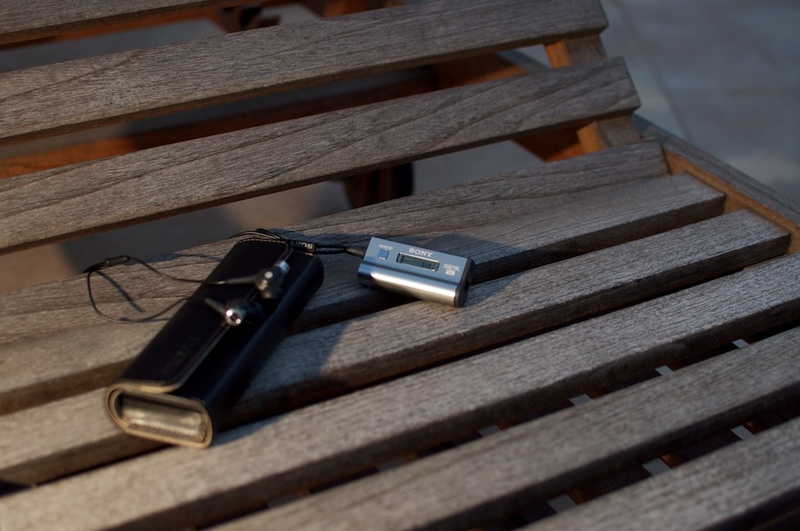 With just one click on the “monitor” button, the noise cancelling system stops and the microphone instead relays the ambient sounds directly to your ears. This comes in handy if you need to listen to an announcement on the plane/train or if the boss is speaking to you at the office. Switching to the back, you’ll find just a single button, the “NC Optimize”. More on that in just a moment. At the top of the unit is where most of the buttons are placed. Starting left to right, is “Sound Mode”, this is for switching between Movie Mode, Bass and Normal. Next up is the volume rocker, up and down, simple. And the last button is of course the “Power” button which also has a “Hold”-feature, kinda like a keyboard lock on cellphones. 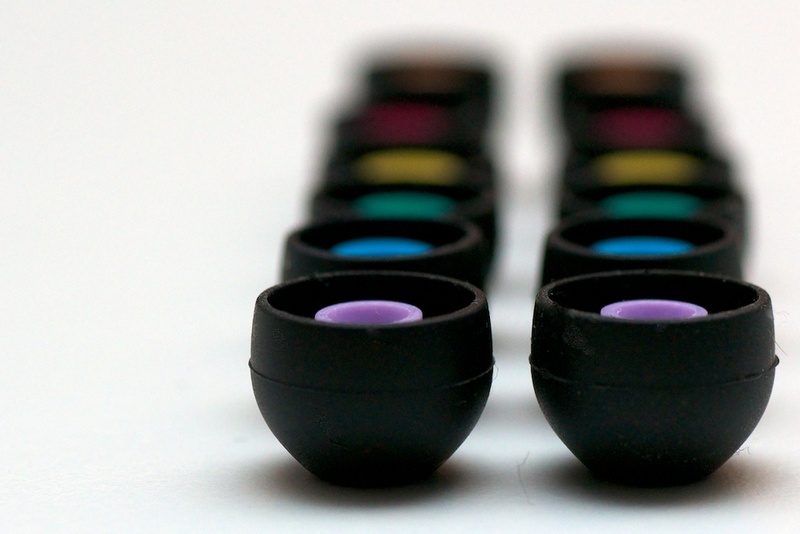 As mentioned, they come with seven different sized eartips so you can find a set that fits your ears the best. What I like to do, is to first find the ones that doesn’t hurt when “installed” in my ears. Then I try to find the ones that seems to be most “stuck”, so they don’t fall out easily. Then comes the real test – wearing them on a commute or where ever you intend to use them, and feel how your ear canal is, afterwards. If they become annoying after extended use, try a different a set of tips (or mix two sets) and go on another commute, until you find the best combination. Sometimes it takes just a few tries and you’re all set, other times it’s a bit more complicated, but in the end it pays to have the best fit possible. Noise canceling technology is not completely new to me. I already own a seat of passive noise canceling headphones, so they don’t have a microphone to pick up ambient noise like the Sony earbuds do. When I tried the Sony earbuds for the first time, I was amazed at how well these small things managed to block my air-condition unit and the soccer game on the telly. I almost missed Rooney’s goal to 2-0 for Manchester United, home against AC Milan, because I couldn’t hear the commentators. Given the fact that these go straight into your ears, and normal headphones only cover them, also adds positively to the whole “block ambient noise”-thing. I’m not an audiophile by any means, I simply like to have audio equipment that sounds good in my ears. It was a no-brainer to conclude that the Sony MDR-NC300D has better audio quality than a pair of stock iPad/iPhone earphones. 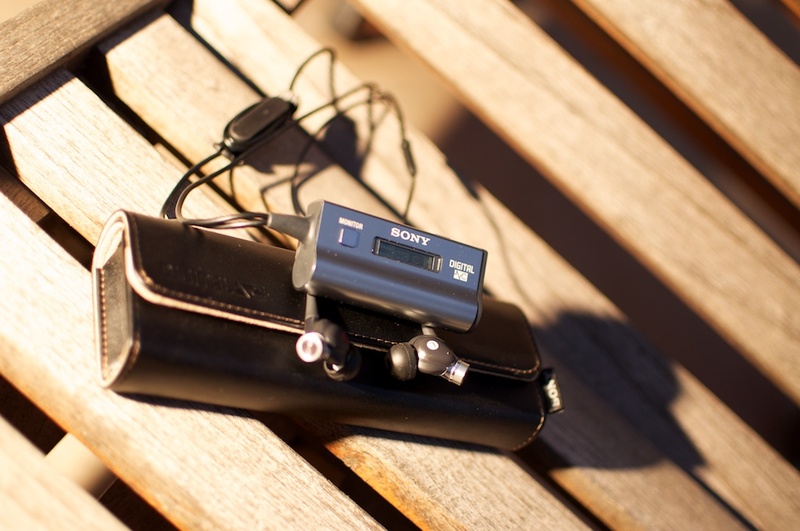 I had more trouble seperating the Sony’s from Apple’s newest in-ear earphones ($79), which I believe are quite good. Not the best, but quite good in my ears. 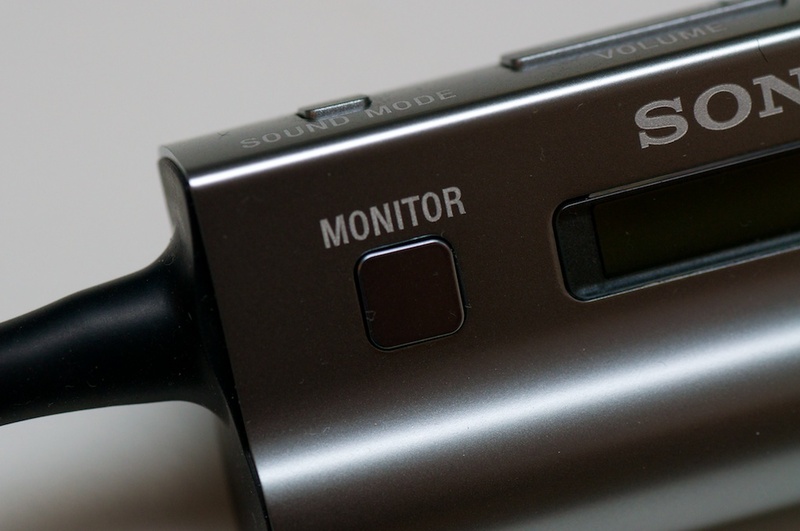 Both Sony and Apple sounds good to me, but the audio in Sony MDR-NC300D just seemed more “full”. 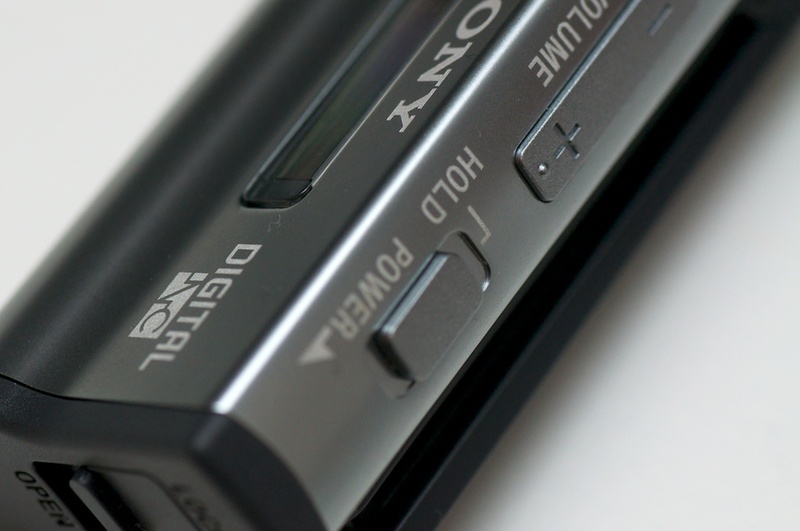 That might be a matter of personal taste, but I would prefer the Sony audio. Of course, if money is not a concern, I’d just go with the Sony set. 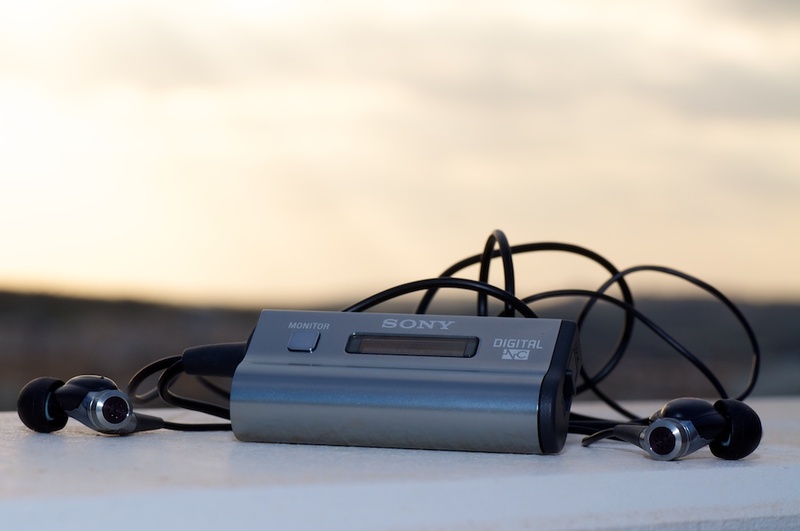 Unfortunately, for most of us, money is a concern and picking Sony MDR-NC300D over Apple’s newest in-ear’s might not be easy if you’re an iPhone/iPod user. 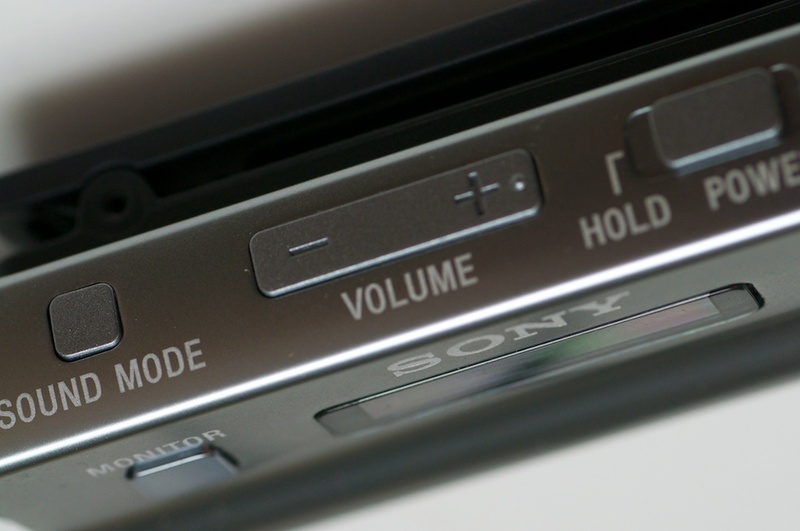 On the plus side for Sony, they do have “bass” and “movie”-mode plus digital noise canceling technology – something that Apple does not. 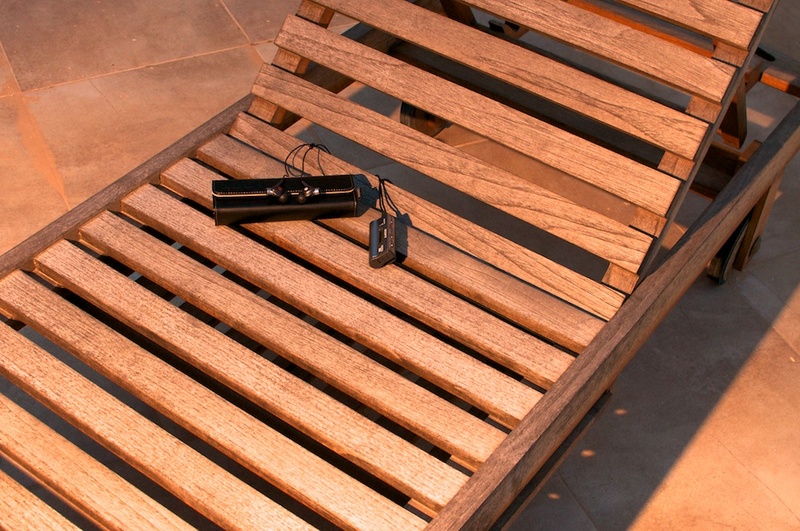 Let’s have a look at what the “control center” can do when it comes to Noise Cancelling. The Automatic AI (Artificial Intelligence) Noise Cancelling function has 3 modes. NC MODE A: Noise mainly in an airplane is effectively reduced. NC MODE B: Noise mainly in a bus or train is effectively reduced. NC MODE C: Noise mainly found in an office environment (PC, copier, air ventilation, etc.) is effectively reduced. 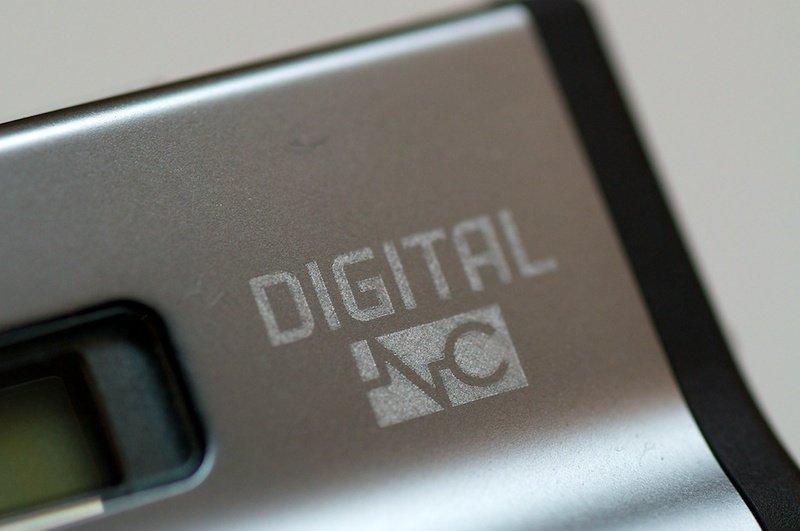 I had the opportunity to test the MDR-NC300D’s in all three situations. So, why don’t we dig in and find out how they performed? 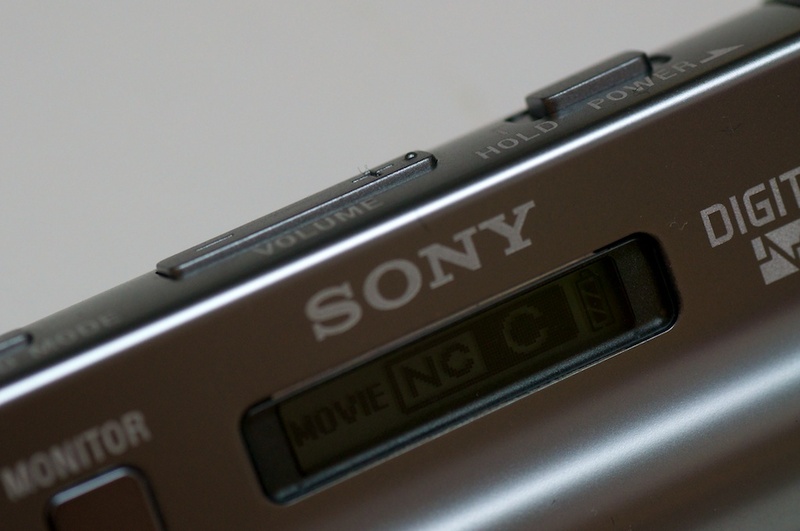 Sony claims that it will reduce ambient noise up to 98.4% and it will automatically select what it believes is the best NC MODE. You cannot change the selected mode, although you can modify it somewhat. I found that it didn’t get the situation right all the times at first, but eventually it would make a good pretty good guess as to where I was. If you’re not satisfied with what it’s doing, simply click the “NC OPTIMIZE” button at the back and you can modify it with the volume rocker, depending on what kind of tones are getting through (high or low). It will remember your setting. 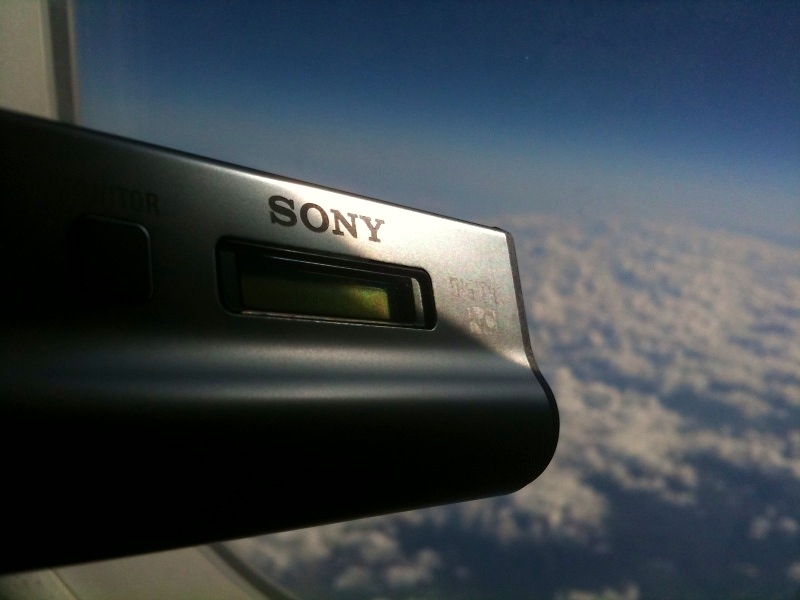 On an airplane, the Sony MDR-NC300D is invaluable. I don’t think I’ve ever finished my airline food that fast before, as I wanted to get back to the Sony headphones and enjoy every moment of them. My music has never sounded so nice on an airplane and the video podcasts really benefit from the “movie mode”, making voices stand out even more. “Movie mode” adjusts the sounds so that explosions etc. appear lower than what they are, and voices are louder and more clearer. While I don’t watch that many video podcasts with explosions and such (none), I would never disable “movie mode” again after having tried it just once and I wish that my TV surround speaker set had a “movie mode” too (and so does my neighbor, I’m sure). The downside of MDR-NC300D, is the overall size. It does take up more space than regular earbuds, because of the attached “control center”. That may or may not be an issue to you, depending on how you like to travel. I just put them in the leather case (and had a spare AA battery with me, too), and then in my pocket. The case does a really good job at protecting the earbuds. They were just as good on the train as they were on the airplane. Likewise in an office environment, except voices etc. were not completely blocked. The Noise Canceling technology works best with more “static” sounds like on a train, airplane, an air-condition, computers humming and such. While outside voices etc. are still somewhat blocked, because of the physical design of being earplugs that goes straight into your ears, with a snug fit. I also used both the shirt clip and the cord wrap. The latter is to simply wrap the cord up a bit so it’s not its full length, as I don’t need it to be that long. The shirt clip attaches to the back of the “control center” and provides both a “stand” for the unit it while it’s on a table (not that you need it, you probably don’t look that much at the display anyway) but the shirt clip also makes it easy to attach to your shirt or other places that might come in handy. 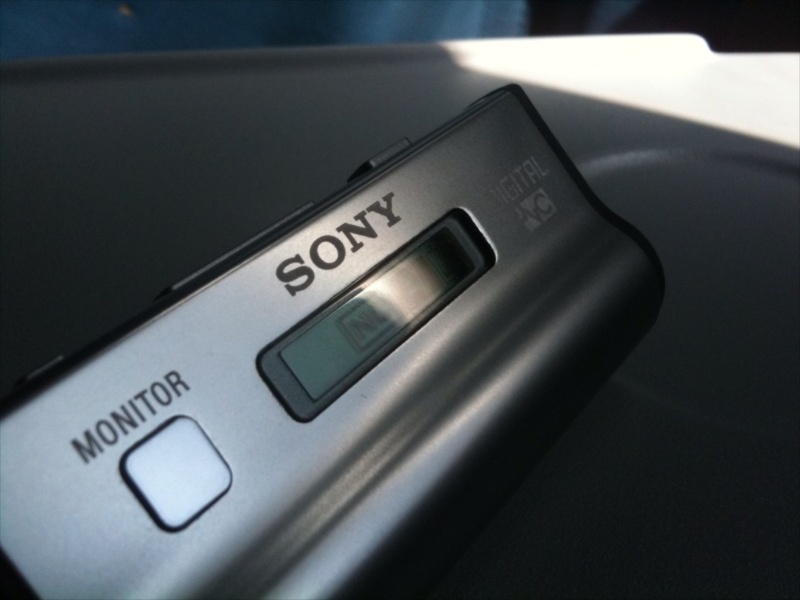 The AA battery will give you up to 20 hours of usage according to Sony. Just don’t forget to leave the unit ON overnight, as this will also drain the battery somewhat. I did exactly that, a few times, and unfortunately it doesn’t automatically turn off even though no music passes through for an extended period of time. Do you remember how much more awesome movies became when you replaced your old TV with a new HD flatscreen? 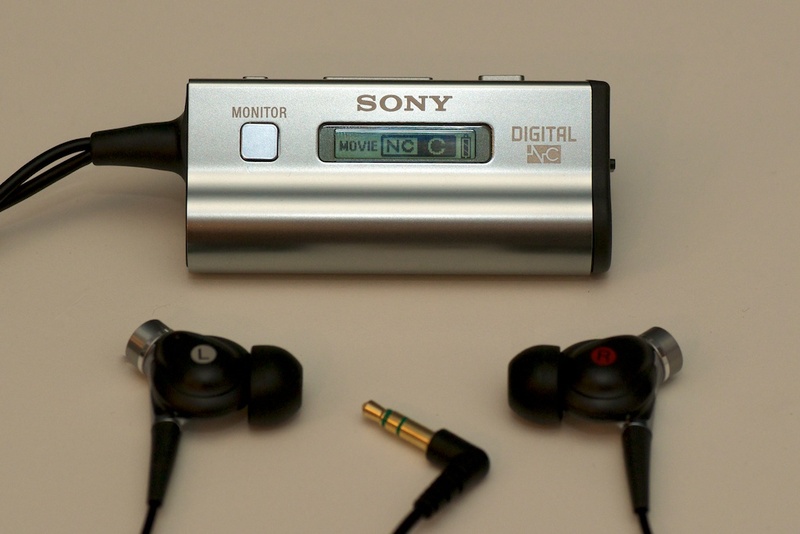 These Sony earbuds does the same to your music when replacing the default earbuds that came with your mobile phone, MP3 player or iPod. 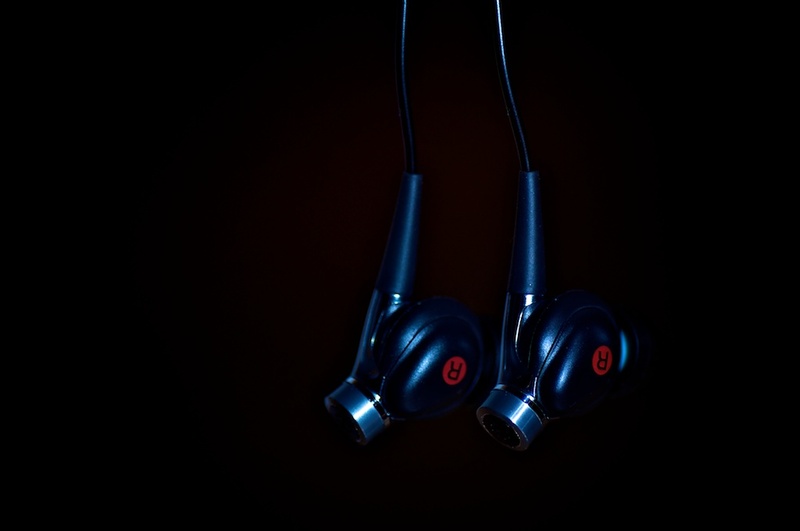 It’s no secret that the standard earbuds that come with many devices are not the highest quality you can get, so no matter what music player you have, you owe it to your music – and yourself – to use earbuds that do your music more justice, than what low-quality earbuds can do. Because of the rather high price tag on Sony MDR-NC300D, the overall size and a missing button to disable the Noise Canceling feature and use them as normal earbuds, I’m rating them 4 out of 5 apples. Now I just have to find a way to lose my Apple in-ear earphones, so I have an excuse to buy myself a set of Sony MDR-NC300D. 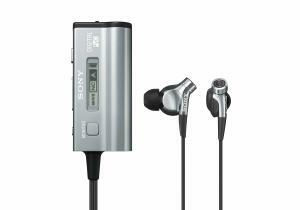 Sony MDR-NC300D has been available since February 2010 and is currently $299/£219 at Amazon. Awesome review – and those photos were so professional! Great job! .-= christie´s last blog ..Quick survey – for and about introverted students =-. SONY is a brand name and the product of Sony is always good , give you always better product and of course with under warranty , so i just want to say that buy product of Sony by blindly eyes. you will be happy always. .-= Sire´s last blog ..Of Easter, PR Updates And Other Things =-. Hi Sire. For me, the bulkiness wasn’t a big deal either. I didn’t mind when I used them on the plane/train. .-= Karen @ Blazing Minds´s last blog ..How To Vet Your Twitter Followers =-. Hi Karen. As usual, thank you for taking time out to comment 🙂 I’m glad you liked the review. I spent a long time doing it as I wanted to do it as good as I could, so it’s always nice to get feedback like this, knowing that my work has been appreciated by some. If you’re in the market for a rather expensive headphones like these, I can certainly recommend the MDR-NC300D. I couldn’t help but wonder… the iphone/ipod should, in theory, be able to do the same thing – shouldn’t it? I mean, it’s basicly earphones with a mic and some processing software. Nothing the iphone can’t handle. Guess it’s all up to apple, but that would rock. But great review, I’ve tried them out on the wifes NWZ-739 (hope I got the model correct) the world goes seriously quiet when you activate noise cancelling. .-= Mars Dorian´s last blog ..How to NEVER run out of Ideas again ! =-. Hi Simon. Thanks for your comment. I can’t sure for sure, but I’m almost certain that they will not support the telephony aspect. I’ve never seen mention of using the microphones for such things, in any reviews or papers. The microphones are there to pick up ambient sounds so that its computer can cancel them out. .-= Klaus @ TechPatio´s last blog ..Apple Delays International iPad Launch Till End of May =-. I have tested them on train , buses an in an office. 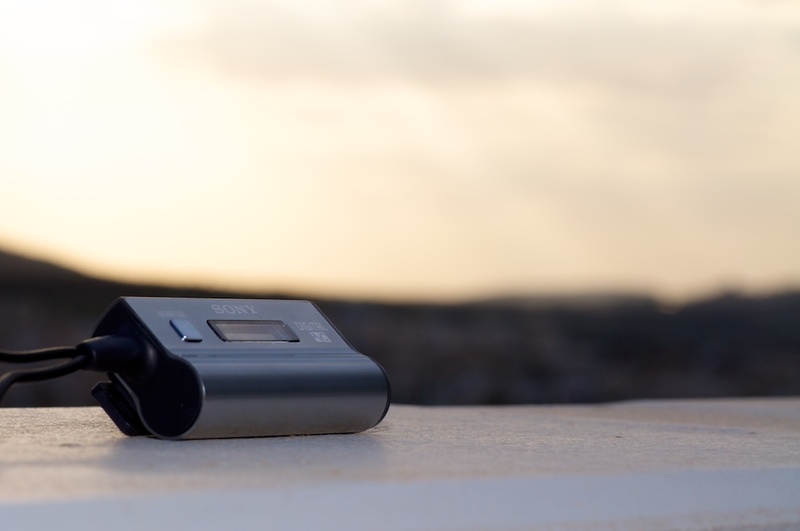 while they work well at cancelling noise, They can run out of juice quickly,there is no sleep mode and they do not work without battery( i.e. no passive sound-through work). Finally the shirt clip seems fragile and easily detaches from main unit which i thing is a little too heavy for it. I don’t think these headphones are audiophile quality-especially since in quieter moments the NC feature working is audible- but movie mode is really nice feature as well as the monitor function! I do think these are the best for active noise cancellation at the moment. Have always been a fan of sony devices & accessories. 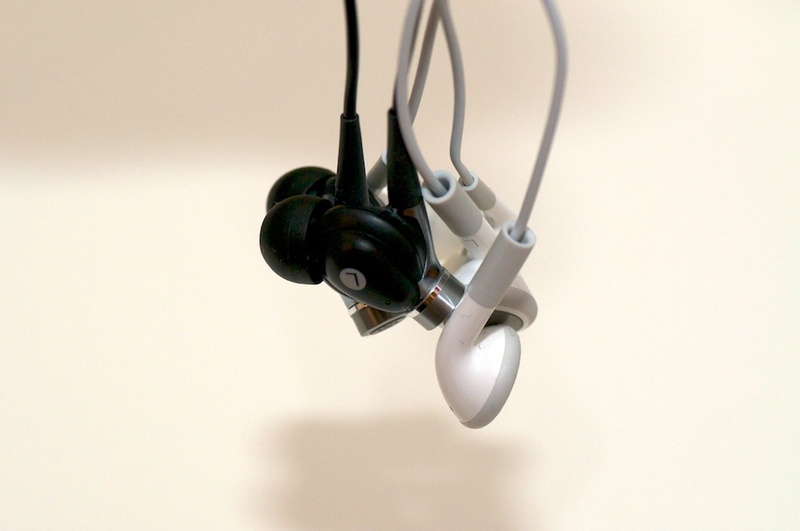 And this is by far the best earphone with NC system in place.